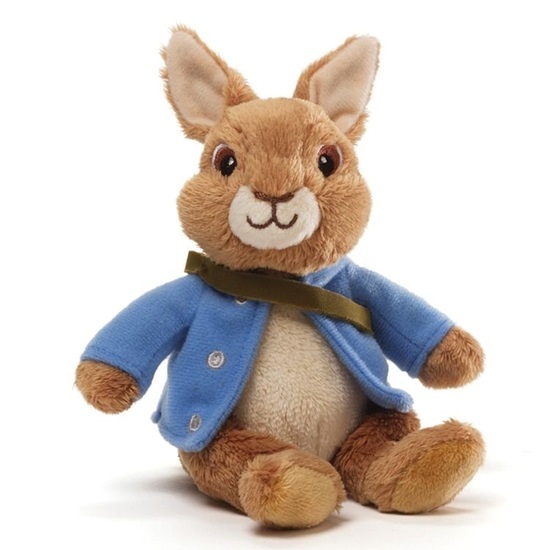 From the hit show on Nickelodeon, we are pleased to share "Peter Rabbit"..
New in 2014 from GUND, we are pleased to share "Peter Rabbit" a soft plush beanbag bunny based on the new hit television show from Nickleodeon. This is a 6-inch soft plush brown and bunny with a white tummy and muzzle. The insides of his ears are a soft tan velour. He is wearing his classic blue cotton coat. A dark green messenger bag is sewn around his neck and under his arm. Peter Rabbit is a rich and beautiful CG-animated, re-imagining of Beatrix Potter's timeless classic children's stories from the early 1900s. The show follows our hero, Peter--a brave, mischievous, impulsive and resilient little rabbit. Peter is also brash and charismatic and possesses a quicksilver intelligence; he encounters real dangers, and he and his loyal friends and family must use their wits to outsmart incompetent villains whose barks are way worse than their bites. Peter's a 6-year-old rabbit who lives with his mother underneath a huge fir tree in a hidden burrow. He misses his late father and desperately wants to grow up to be just like him. Armed with his father's journal, which is basically a guide to everything one needs to become a truly wild rabbit, and aided and abetted by his two best friends, Benjamin and Lily, Peter sets off to make his own mark in life and have adventures even greater and grander than his dad's. But where do the adventures begin? From Mr. McGregor's beloved vegetable garden to Squirrel Nutkin and his treetop tribe of squirrel nutcases, Peter seems to have a knack for discovering a world of adventure--and because of Peter's insatiable curiosity, a bit of trouble as well. Set in Beatrix Potter's beloved Lake District in northern England, Peter's milieu is the authentic world--majestic and beautiful--where behind every tree and rock there is something new to discover and where real dangers (an inept smooth-talking fox or a foul-tempered badger) lurk in every nook and cranny of their magical habitat. Told with humor, relevance, and a gigantic heart, these Peter Rabbit stories introduce a whole new generation of children to the delightfully funny and magical world of Beatrix Potter.